I started this blog back in May of 2009. Since then, I’ve written almost 700 posts. And a book. And what’s a celebration without a decadent treat? I made a Chocolate Silk Pie to mark this blogging milestone. My parents used to serve a similar French Silk Pie in their restaurant when I was a kid…I have such fond memories of that pie and have been wanting to make one like it for a long time. This pie is so easy to prepare and it’s absolutely delicious: I think it perfectly symbolizes where my blog and I are at these days and what you can expect to see here in the future. Though I sometimes feel like the odd one out for having a healthy recipe blog that does not fit neatly into a specialty dietary category such as “clean foods”, “gluten-free”, “vegetarian”, “vegan”, or “paleo”, I am really more than ok with that. I’ve always been inclined to just do my own thing, and I don’t much like labels anyway. 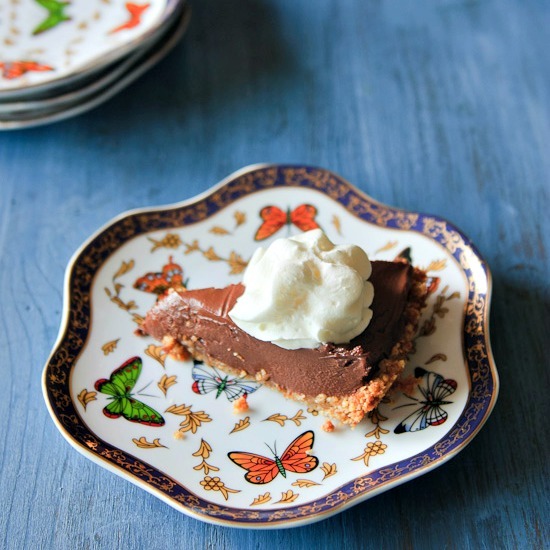 I truly believe all foods can have a place in a healthy diet…even chocolate pie. I have always championed simple home cooked recipes and balanced living here and I will continue to do so. -I made this pie twice: once with a coconut walnut crust and once with the peanut crust you see here. Both were press-in, grain-free crusts but I preferred the peanut one (you can’t go wrong when you combine peanuts and chocolate, you know?) so that’s the recipe I am sharing with the pie. If you can’t eat peanuts (or don’t like peanuts), feel free to substitute your favorite homemade or store-bought crust. -There are raw eggs in this recipe. If that scares you, don’t make this pie, or make it with pasteurized eggs. I have my own chickens so I am not nervous about using raw eggs: I have been eating them for years. All the same, do use caution if you are pregnant or fall into another group that’s been advised not to consume raw eggs due to the risk of salmonella. -I took my friend Amanda’s advice and chilled the pie filling for a few hours before spreading it into the cooked pie crust. This worked very well! 1. Using an electric mixer, cream the butter and sugar together for 4-5 minutes, until light and fluffy (it's important to beat these well, so the pie filling won't be grainy). 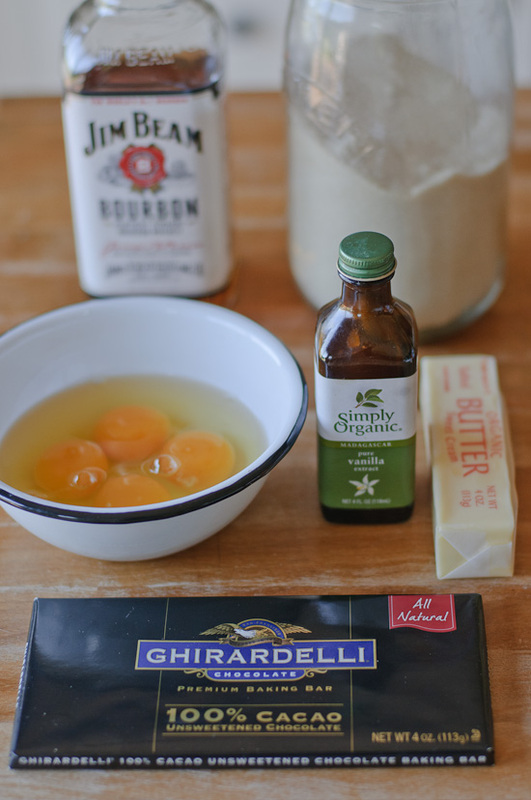 Add the vanilla extract and the bourbon, if using. Add the melted chocolate and beat again until all ingredients are well combined. Add the eggs, 1 at a time, mixing very well after each addition. 2. Cover the bowl and refrigerate the filling for a few hours or overnight. 2 Spread peanuts onto a parchment or silpat-lined baking sheet and roast for 8-10 minutes until they are fragrant are starting to brown. 3. Allow peanuts to cool completely, then in a food processor, process the peanuts with the sugar until the mixture is very finely textured (it should also smell amazing). 4. Add the egg white and pulse until the mixture just comes together, then press it into a lightly buttered pie plate. 5. Bake the crust for 8-10 minutes, until it is dry and lightly browned, then allow it to cool completely before filling it with the chocolate mixture. 6. Cover and refrigerate the pie for several more hours to allow it to set, then serve as is, or with whipped cream (you may find the pie easier to slice if you freeze for a bit before serving). Pie filling adapted from Molly O'Neill's recipe for The New York Times. Pie crust recipe adapted from The Fannie Farmer Baking Book . LOVE the redesign! The new logo is fantastic! Congratulations! The site is beautiful… love everything about the re-design, the colors, logo, layout and the cake! Happy 5th Anniversary! Thank you SO much Georgie!!! Happy Blog Birthday! I love your new look. Thank you Liz! I was really ready for a change. Congrats on 5 years Winnie!! How amazing!! I absolutely LOVE the new design, it’s so perfect! Happy Blogaversary ;) Oh and I wanna inhale this pie, thanks! Thank you Beth! I am glad it’s finally done! And yes…the pie is worthy of inhaling hahaha. I Love the fresh, new digs. Very nicely done and congrats on 5 years! Thank you so much for everything you write about. I love your perspective and your words. You know, I flirted with the idea of doing this…there is something so tempting about a new space! Congrats to you and the new site is lovely. Congratulations on your 5 years. It’s nice to find a site that isn’t stuck on one of the eating fads. I could go on for a long time about some of those. This pie is more than I can afford to eat calorically, but it sounds wonderful. I will let it be eye candy… also love your butterfly plates. Since I’m new to the site, I can’t compare it with the old one. What you have now is beautiful, nicely done. I wish you many more years of enjoyable blogging. LOVE your new site design! So fresh and clean! Gorgeous! And congrats on 5 years! You are such a blessing! About that chocolate silk pie – I want a piece right now! :) Thanks for sharing the recipe! Thanks so much Kelly…you are so sweet! It is rich and creamy, indeed. Thank you for letting me know you like the design! Thank you Meg! Still working out a few kinks, but I am loving it, too! Congrats on all the huge accomplishments that the past five years have brought! I like the pretty new space you two have designed here very much. congratulations! the site looks great and so does the pie! I love the new look Winnie! Happy 5 years! This pie looks ahhhhmazing. Pinning now! Where did you find those gorgeous butterfly plates? I love them and I want them! The pie looks awesome – can’t wait to try it. Thank you for posting it! I love the new look Winnie! 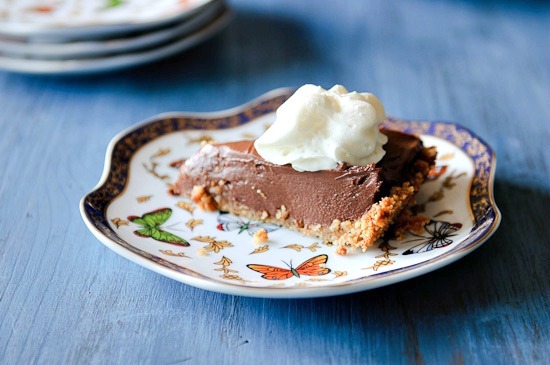 And thanks so much for the link, this is my favorite chocolate pie ever. Love that you made a peanut crust. Winnie – I love love love the new site design, it’s so vibrant and alive!! I LOVE the new website design, Winnie. So earthy and simple, yet beautiful. Great font choices, as well! Good job! Of course, that pie looks divine, as well. Congrats!! I just found your blog via My Humble Kitchen. It’s beautiful – congratulations on 5 years! I am a brand new blogger so 700 posts and 5 years is astounding to me! 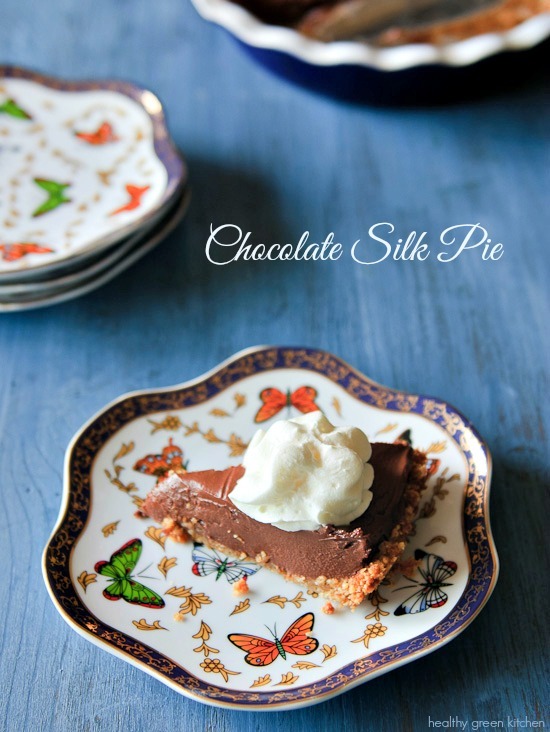 Thank you for the chocolate silk pie recipe – it’s definitely a favorite of mine. Congrats, again! Lovely new blog design and that pie is something else! Congrats to you! I appreciate that your philosophy on food, and your blog, have evolved since I started following it. I’d much rather read about the rationale behind this evolution, as my take on food evolves as well, than be stuck in an unchanging closed-minded viewpoint. Thanks for your take! !